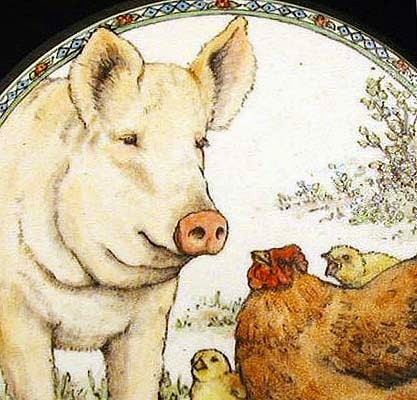 A hen and a pig were walking down the street together when they passed a sign advertising ham and eggs. Said the hen,“Isn’t it great that we can be of service? Doesn’t it make you feel just wonderful to be able to do something for others?” The pig replied, “For you it is small daily service given with little cost to yourself. For me, it is total commitment! The hen was involved, but the pig was committed! The journey of success is long and dotted with a series of commitments to worthy goals. A person does not become committed to worthwhile goals just by making the declaration or decision. It must be daily progression toward established purposes. Dale Carnegie once said, “If you are not in the process of becoming the person you want to be, you are automatically engaged in becoming the person you don’t want to be.” Goals that we set to become better people are just that without commitment. Total commitment entails work. Our actions have to mirror what we say. Goals should always be made to a point that will make us reach and strain. “Success should not necessarily be gauged by always reaching the goal set, but by progress and attainment.” (Spencer W. Kimball) True happiness is not made in getting something. True happiness is becoming something. This can be done by being committed to lofty goals. We cannot become something without commitment. The simple differences between those committed and those who are not is the difference between the words want and will. To reap the full benefits of life, we must fill our days with commitment to worthy goals. We must be all the way in! As we stay accountable to our commitments by appropriate actions, we will find that we will grow and improve along the way.